Midvale, Idaho — My road to high level stockmanship actually started while driving down a road in Idaho with Holistic Management founder Allan Savory. In listening to Allan, I learned that I had deeply held beliefs about grazing that were dead wrong. I learned that overgrazing is not caused by too many grazing animals. I learned that too much rest is damaging not only to the plants, but also to soils. In humid climates, it hurts forage plant productivity and nutrition. 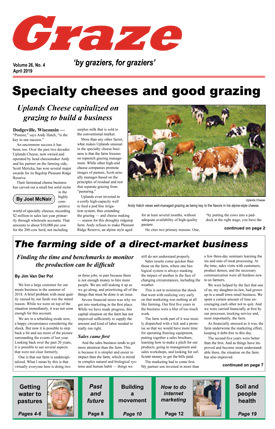 The key in avoiding damage is to not allow stock to re-graze without adequate rest (recovery). Control the time, and you control overgrazing. Also, you need to manage so that a high proportion of plants are grazed. My concern about what Allan said was that following his principles would require much better control than even the best riders could achieve on bigger pastures and rangeland. So I went to a few of Bud Williams’ Low Stress Stockmanship schools. A few of my USDA-NRCS colleagues and I put the Savory grazing (and management) principles and Williams’ handling together, and we won some of the nation’s highest conservation awards. In subsequent years I found that it really pays to handle your cattle properly on smaller pastures, too. Good control over stock facilitates good grazing management without necessarily spending more on infrastructure. With good handling, you can put cattle where you need them and for the time you want. Cattle like moving to new places and will eat more when they are moved and settled properly. But if they anticipate moves they will be shortening their grazing time and not grazing a high a proportion of the plants. If they are hard to drive, there will be stress and they won’t be settled on new pasture. If they don’t stay where you put them, or won’t go to certain places like the upper areas of pastures, some areas will be overgrazed while others are over-rested. If mother cows rush when you start to move them the calves can be upset, and later the mothers are stressed and won’t be at home on the new pasture. So in this article, I will focus on training a typical herd to drive and turn well. Before you drive or turn your herd, make sure you have worked the cattle so that they are fairly calm and trust you. They should move straight ahead at a good walk when you pressure into their sides or if you walk straight lines behind them, back and forth. Stock should slow and stop as you go up the sides, and speed up as you go against the direction of movement. I’ve discussed this kind of preliminary handling in previous articles. I work them until they are decent at doing these things. 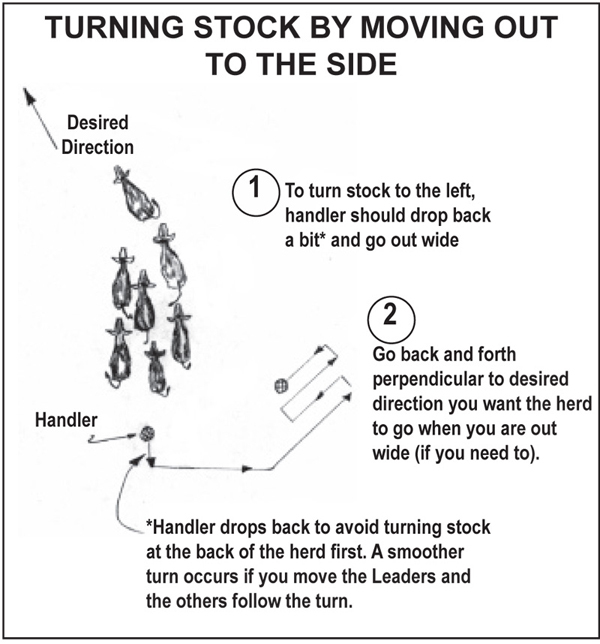 With a herd of 25-40 on a small pasture, this might take a few hours if you are new to low-stress handling. I then gather them together in a fairly close bunch, but not crowded. I am going to train them to drive well, meaning that they go straight ahead at a good walk and keep going, follow the movements of others, stay with the herd, speed up, slow down and stop readily. A field or pasture where I have enough room to move and turn them gradually works well for this exercise. I will go back and forth in straight lines, zig-zagging in a T to the direction I would like them to go. If they choose another direction, that’s OK at first. The herd should start lining out, animals with the longer pressure zones (the more sensitive ones) moving first. Most herds will have a few that line out in the lead and keep going more than what you are prompting them to do, thus putting some distance between themselves and the rest of the herd. You may also have a few that want to turn left or right, or take rabbit trails. These may require some patience to fix, but fix them you should, as they make moving even small herds difficult. They will be the cattle that don’t settle, walk fences and be hard to load on the trailer. When I see that some are getting ahead too far (thinking on their own accord), I walk up the side of the herd to slow and stop them, then follow in behind the ones acting on their own. I’m not driving, but I’m also not going away. Follow directly behind, and soon they may slow and stop. If so, I stop. I will wait a minute and, when they are calm, ask them to go again. If they walk in a relaxed manner, I will turn them left or right by moving out wider to the right or left. If they turn readily, I will circle them around until we are back in the herd. Then I relax and let them settle in it for a few minutes. If I am pressuring a herd to go forward but one animal is looking to turn left, I immediately move straight out to the left. It is now turning toward and into pressure, so it will turn back toward the direction of the main herd. When it does, I go back to moving back and forth behind the herd. You might have to do this a time or two. Start the herd again by zig-zagging in a T to the direction you choose (see diagram below), and give the bunch a minute to form. As movement starts, the pressure zone will increase a bit, so be aware of that change and don’t chase the movement. You decide the pace the herd walks. As the herd reaches the pace you want, relax the pressure. If they start to slow, pick up your pace, and perhaps take a sharper angle on the zig-zags until they return to the preferred pace and you can relax a bit. Try speeding them up a little. When they do, relax. They will get the idea: If they are too slow, there’s pressure; if they are at the right pace, the pressure will relax. They will seek that relaxation. As a rule, make sure the cattle profit from everything they do right, while making unprofitable everything they don’t do correctly. Never block (force) the cattle from going the wrong direction or from leaving the herd. Also, don’t scare them in the desired direction. Use the techniques I suggest, and quietly persist. Now you should have a herd that stays together, walks at a good pace and keeps going at that pace and with only reasonable effort on your part. At this point, when the herd is going at a good walk, go out wide to the right (see diagram below). You may need to work back and forth when out there until the lead animals turn a bit to the left. As soon as this happens, get back behind the herd. That’s their reward for turning. Do the same thing on the other side of the herd. Practice doing this and if all goes well, you have a herd that will turn well. 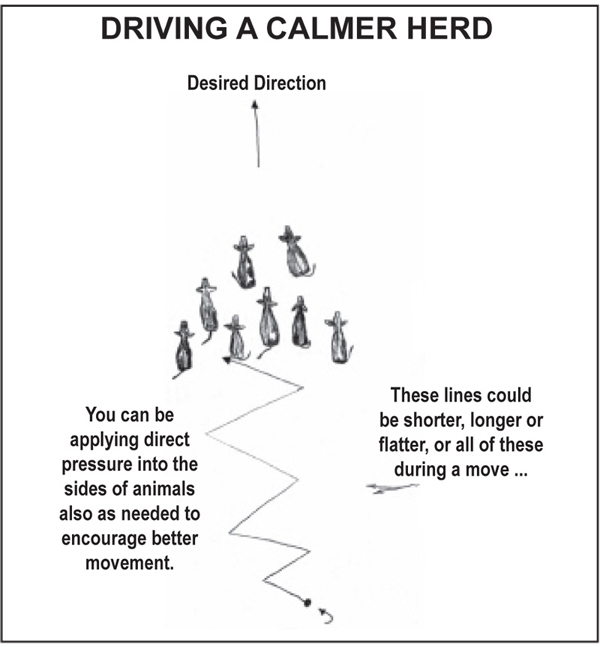 Now keep driving the herd straight, but slow your pace and start walking flatter (less angled lines). The herd should slow. Walk up the sides and see if they all slow, and stop as you go by. If they all stop, are facing forward and are looking at you, you are done. If at any time the herd does not do something well, ask again when they are calm. You may need more time to get a feel for your cattle, and they might need more time to become OK with what you are asking. Next time I will discuss how to move pairs, have cattle calmly move past you at the gate, settle cows on new pasture, work with cows that rush and leave calves, and deal with cattle that rush moves to new grass.